Challenges - A to Z Title, 100+ and New Authors. This is one of two book reviews today, so please do also look at the one below. Do ever pick up a book and hope that you will love it from the beginning. The first chapter feels promising and then after that your disappointment starts to seep through. Well this was definitely one of those books. I borrowed this from a friend who had enjoyed it, so I had all hopes of enjoying too. The blurb on the back sounding so promising and the reviews on Amazon were really good. The story starts with a woman called Abie, recieving a letter form Africa, telling her that if she wants she can have the family owned coffee plantation. 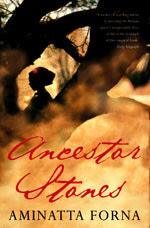 She returns to Africa and is confronted with layer upon layer of family history, which her four aunts wish to tell her before she decides whether she wants to take over the plantation. The story then begins with her four aunts each telling their own stories. Each aunt born to a different wife of a wealthy plantation owner who was Abie's grandfather. Each aunt has had a tough life, that cannot be denied, and their stories deal with harrowing subjects that we living in civilised societies can only imagine and read about in the papers. So with each story you get the real sense of what it felt like for them. However, the book felt almost disjointed to me. Each aunt would start talking about one subject and then move forward and backwards in time, talking about different things. I had to keep rereading bits, because I felt lost within. One minute they were talking about 1971, then they would drift back to their childhood and then forwards to the here and now. I found that in some topics I really didn't have a clue, as to what the author was trying to say as it read so vague and even after rereading it twice, I felt none the wiser. With every aunt, I had to keep checking back to the previous chapters to see what I read about her before, because it just felt like it was all over the place. The aunts and their family members regularly seem to change their names, which just made it harder to work out who I was reading about. Abie, who you believe to be the main character, is lost after the first couple of pages and only returns briefly at the end. I would have liked to see her journey interspersed between the chapters about her aunts. I feel terrible to put this book down, as others seem to really enjoy it. So I apologise to anyone who did enjoy it, but this one was definitely not for me. It's not you. Mr. Linky is having technical issues. If they are having an ice storm or something like that, it will be down. Just post your title and link in the comment section and I'll add it as soon as it's up again. I'm sorry you didn't like this more but just because a lot of others did doesn't mean you have to. I've had that happen before too. Don't worry about it and move on to the next book. sorry to hear you didnt enjoy this one, you shouldnt feel bad about that. I wanted to let you know I have this link added under Mr. Linky for the 2009 Support Your Local Library Challenge. Mr. Linky is working again. Let's hope it stays that way!